All those who are close to Prabhas keep saying the Actor hasn't changed as a person even after becoming Pan-India Star with Baahubali. The only noticeable difference anybody could spot in the Young Rebel is the change of hair styles. Off the screen, Prabhas used to maintain the same hair style prior to Baahubali. He, however, kept experimenting a lot in the recent past. There is a significant change in his hair styles be it when he was spotted in Mumbai post the release of Baahubali 2 or During Destination Wedding of SS Rajamouli's Son or Today's birthday celebrations of Krishnam Raju. 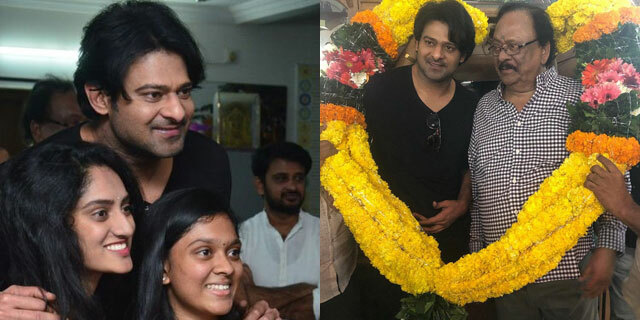 Fans are happy with the new looks attempts by Prabhas. Though few of them have been hit n miss, Making an attempt is far better than trying nothing...isn't it? The new hair style of Prabhas could become a trend. Is it for the period flick he would be shooting soon?